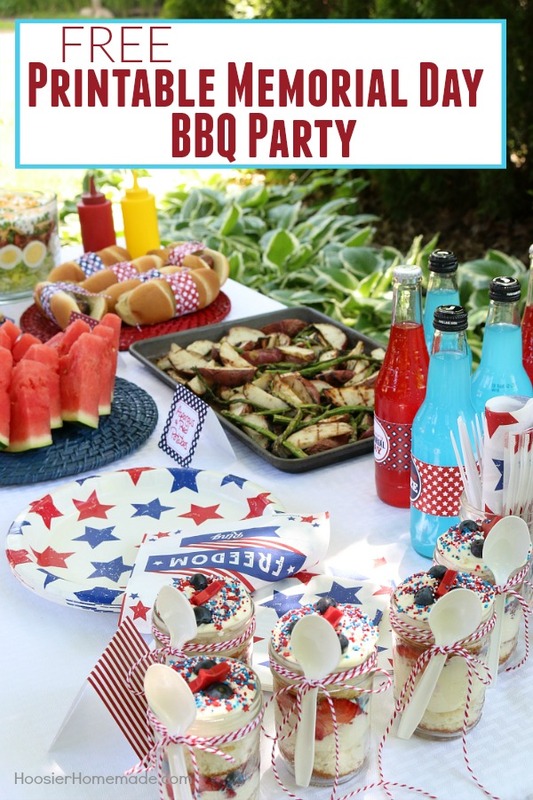 It’s time to fire up the grill, invite your friends, whip up a fun dessert and throw a Printable Memorial Day BBQ Party. 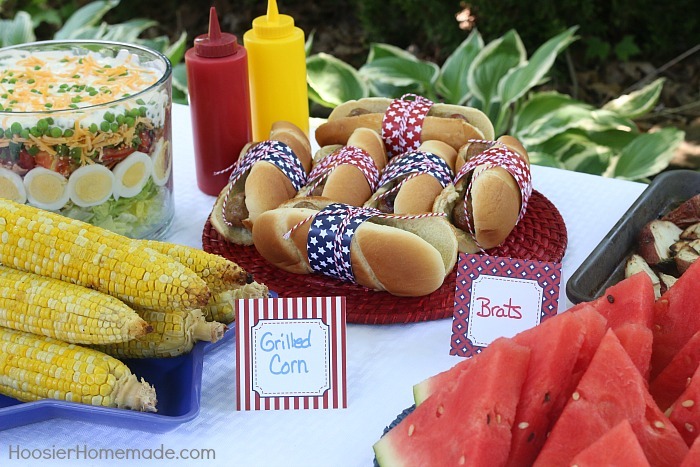 These free printables come complete with drink wraps, hot dog papers and tented cards for food. Summertime to me means lazy days soaking in the sun and easy cooking. No fussing in the kitchen for hours at a time. 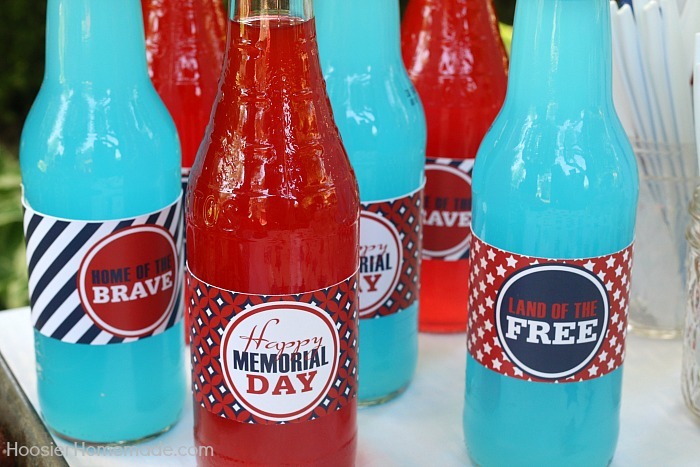 This Memorial Day BBQ Party is super easy to put together and the addition of the printables makes it really fun. 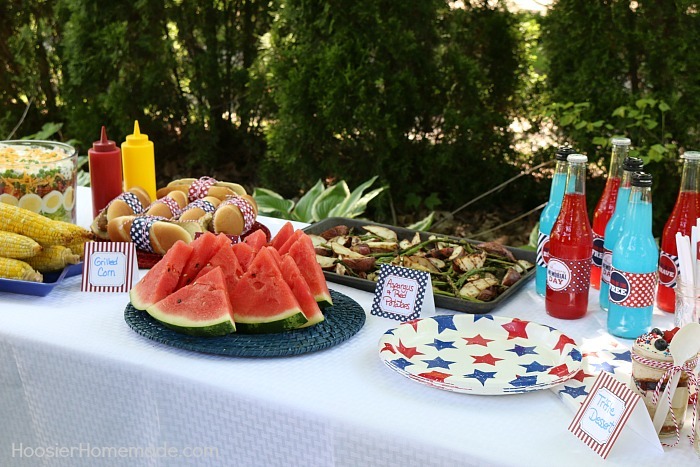 Whether you are hosting a Memorial Day Party or celebrating 4th of July – red, white and blue food and decorations are a must. 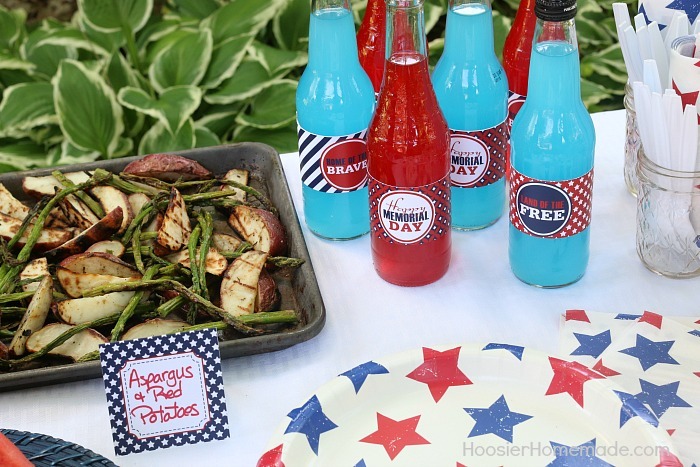 We used old fashioned bottles of red and blue soda and added the printable drink wraps. The red soda is a Mexican drink called Jarritos and the blue soda is Jones Soda Co. The hot dog papers are a full sheet of red, white and blue patterned paper. You can use it for anything really. I cut the paper into 2 inch wide strips, wrapped the brats and tied it with red twine. 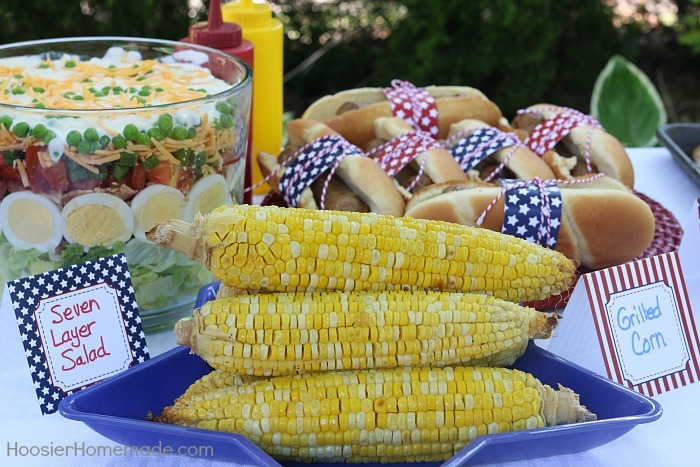 Grilled corn is one of my favorites. Whip up some herb butter to serve with the corn on the cob – everyone will love it! The Seven Layer Salad can be made the day ahead. Cut all the ingredients and store them in an airtight container then assemble the day of the party. This salad is a favorite of mine – grab the recipe. These Grilled Asparagus and Red Potatoes are super easy too. I often struggle with trying to figure out a vegetable side dish when hosting a BBQ Party, this recipe was super easy. Of course, it wouldn’t be a party without dessert. The Easy Strawberry Blueberry Trifles have layers of white cake, pudding, strawberries and blueberries and whipped topping. To make them extra festive, they have fun sprinkles and red chocolate stars. All of the layers can be made ahead and assembled the day of the party. Easy – Peasy! 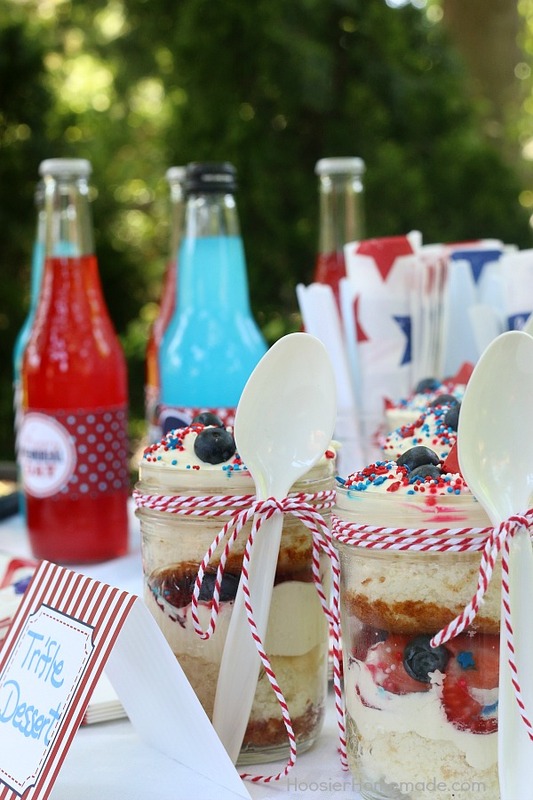 If you are hosting a 4th of July Party – some of the drink wraps can also be used. 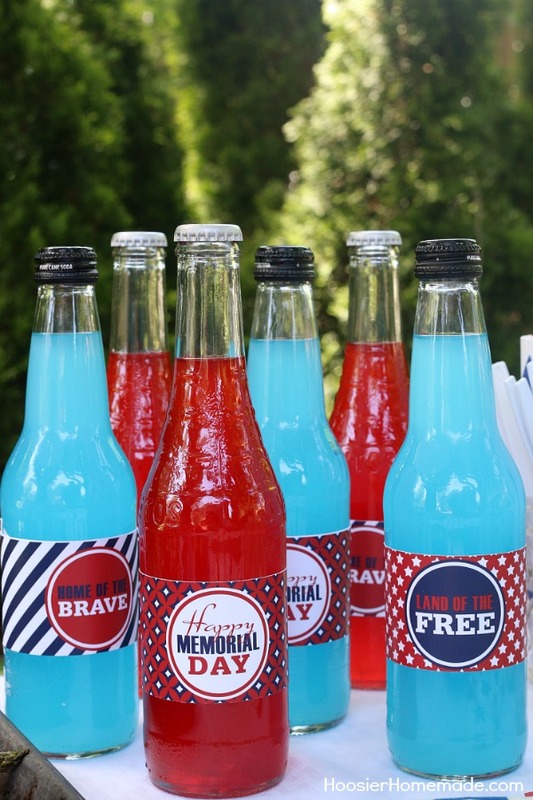 There are 3 versions of the drink wraps available – Happy Memorial Day, Land of the Free and Home of the Brave. And lastly, slices of watermelon are always a hit. 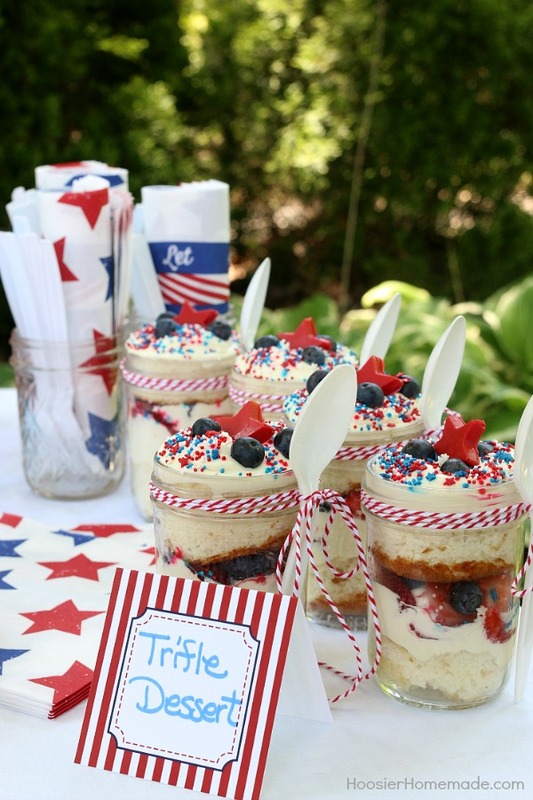 They are served on a blue wicker charger to stay with the patriotic theme. Red and Blue Soda – Jarritos and Jones Soda Co.